To do this, open the EP configuration utility from the Start menu, go to Settings --> Caching purge sources and type the I.P. address of any computer which will issue a PURGE command. At minimum, you need to type the IP address corresponding to your Plone or Enfold Server. This is required if you are going to run a PURGE command from within a Plone product. If you intend using a local command-line tool (like cURL) along with a remote Plone server, you must include the I.P. addresses of both the localhost (127.0.0.1) and the Plone host. do it from within a Plone caching product (like CacheFu or CMFSquidTool). Version 4x of Enfold Proxy includes a way to purge cache. To do this, select the Purge option on the left panel of EP's configuration utility. By checking or unchecking each proxy definition, you can delete the cache for one or multiple proxy definitions. Portal_cache is a product that comes installed by default on Enfold Server. It also comes with the CacheFu suite of products. This product (visible in the ZMI, but not Plone), lets you input a specific URL you wish to be cached. Keep in mind that this URL will only cache a specific item. So if you try to purge www.originalfunsite.com/news, it will not purge cache of jpegs or css files used on this web page. Instead this request will purge only the contents of that page (minus the css/jpg/gif/js files). Go to the ZMI for your site and open the portal_squid tool. Located at /Plone/portal_squid (Plone Site Setup --> Zope Management Interface --> portal_squid (in right panel, near the bottom). If you install the CacheFu product, you can issue a global command to purge all the cache. See the CacheFu documentation for information about that. http://plone.org/products/cachefu In addition, the CMFSquidTool product (which comes on Enfold Server and documented above) includes the ability to do a global purge. When using a Plone product to issue a PURGE command, you need to include the I.P address of the Plone server with the Plone product. In the Chasseur product in Enfold Server, all cacheable items are cached for either 15 minutes or 60, depending on the policy you set. For images and css, there is little risk. But what if you have a special URL (such as a home page or announcement page) where the content needs to stay as up to date as possible? One solution (in CacheFu) is to create a new rule to handle a custom content type. (You will need to choose the Add New ContentCache Rule on the right dropdown box on the Rules tab). But an easier solution may simply be to include a simple python script to purge the cached item every time a Plone page has been republished. The following steps illustrate how to create a simple Python script which will trigger a purge request. Using the Zope Management Interface (ZMI), click to your Plone site. Navigate to http://PloneServer:8080/Plone/portal_workflow/plone_workflow/manage_workspace (where Plone corresponds to your Plone site). Click on the Scripts tab. Using the Add dropdown tool on the right, add Script (Python). In the new web form, list "Purge content on Publication" in the title and the word "state" in the Parameter list. 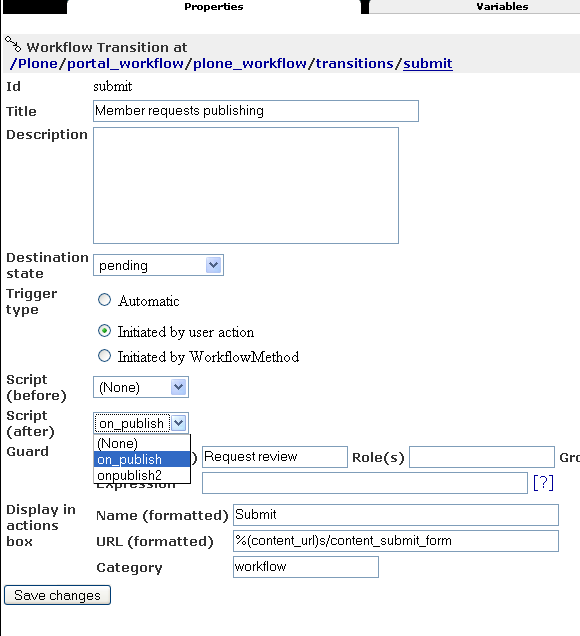 Press Save and ascend through the web interface to http://PloneServer:8080/Plone/portal_workflow/plone_workflow/transitions/submit/manage_workspace . You will see a dropdown box on the Script (After) field which lets you select the on_publish script you have just created and added. Adding this will cause a Plone page cache to be purged whenever it is republished.